Crown Point State Historic Site will host its annual French and Indian War Encampment on August 12 and 13, 2017. This is the largest event of the year at the site and features authentically clad French, British, and Native American participants camped among the fort ruins. 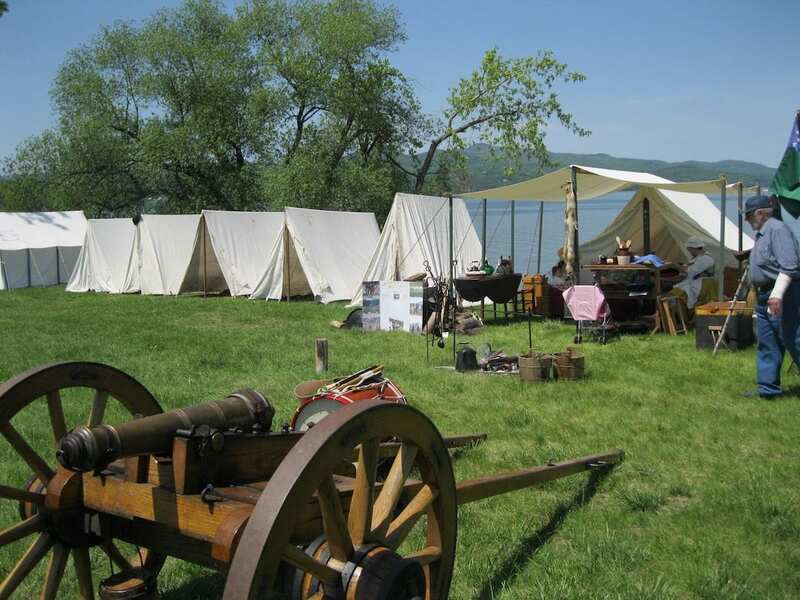 Guests to the camp will be able to interact with the participants portraying various people of Crown Point’s past and also have the opportunity to purchase some of the 18th century wares produced and exhibited by artisans and merchants. The camps will be open for visitors between 9:30 am and 5 pm on Saturday and between 9:30 am and 3:30 pm on Sunday. 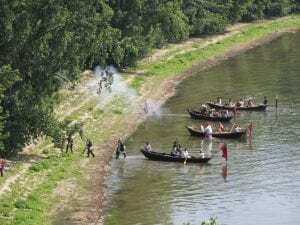 At 2 pm each day battle reenactments will be held where the public is invited to witness a demonstration of 18th century battlefield tactics including a naval assault accompanied by a great deal of musket and artillery fire. Guests interested in the battle reenactments should arrive early allowing time to park and get into position for the best view. Parking is convenient and free of charge on the grounds of the site. The ruins of the French Fort St. Frédéric and the massive British fort of Crown Point offer a perfect backdrop for the encampment and the battles. These ruins are among the few remaining examples of pre-Revolutionary military construction in the United States and both have been individually designated as “National Historic Landmarks” by the U.S. Department of the Interior. Today they are preserved and interpreted as evidence of the great struggle during most of the 18th century between Britain and France for dominance of North America. Visitors interested in learning more about the construction, destruction, and preservation of these forts will want to visit the site’s museum, with its high-definition audio-visual show and archaeology exhibit. 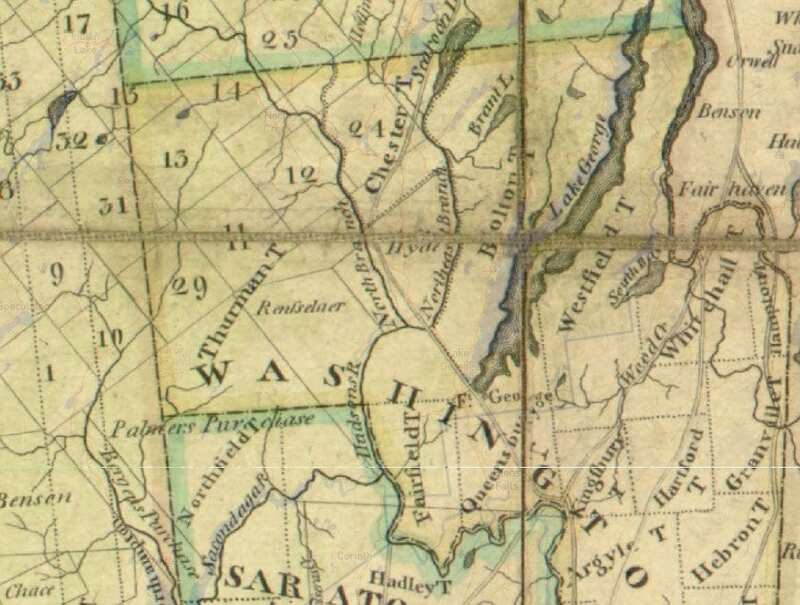 Crown Point State Historic Site is located at 21 Grandview Drive in Crown Point at the foot of the Lake Champlain Bridge. Call (518) 597-3666 for the Crown Point museum. The site is open daily from sunrise until sunset with the museum opened from 9:30 am to 5 pm, Thursday through Monday. New York State Office of Parks, Recreation and Historic Preservation oversees 180 state parks and 35 historic sites, which are visited by 60 million people annually. For more information on any of these recreation areas, call (518) 474-0456 click here. 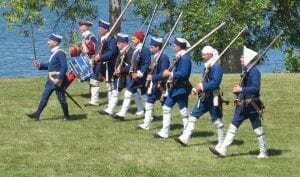 Photos from above: French Marine Reenactment, and British Landing Reenactment, courtesy NYS Parks.